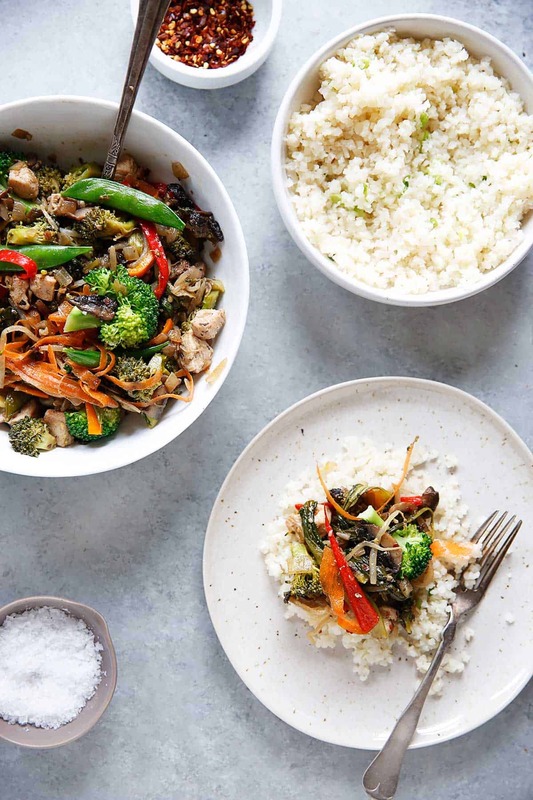 This Paleo Chicken Stir Fry uses cauliflower rice, whatever veggies you have on hand, and is so simple to throw together! 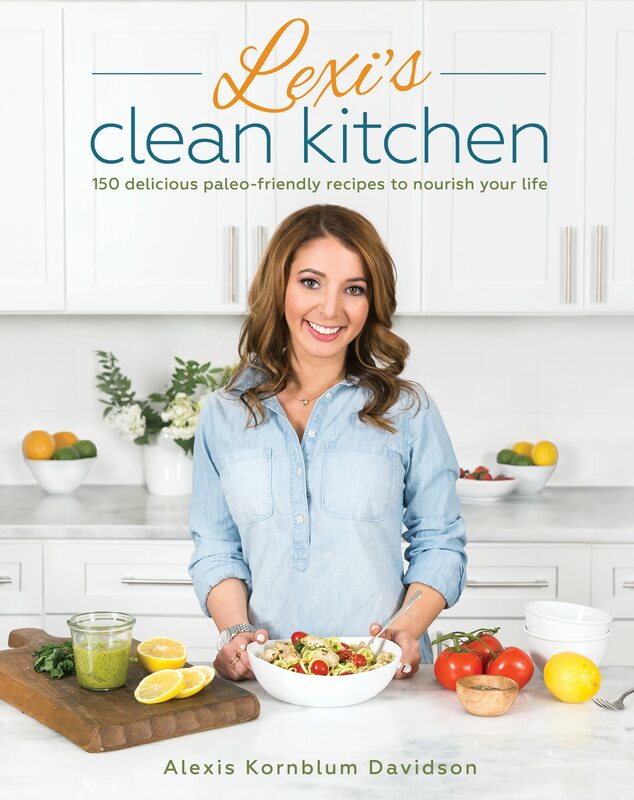 It is a great Whole30, low-carb, dairy-free, egg-free, and gluten-free meal for any night of the week! 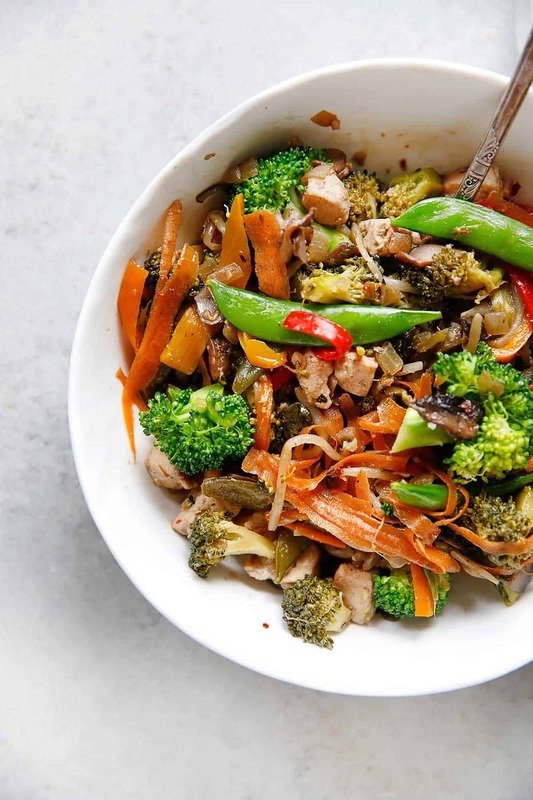 Stir-fry night should also be called clean-out-your-refrigerator night to make a delicious, quick meal! 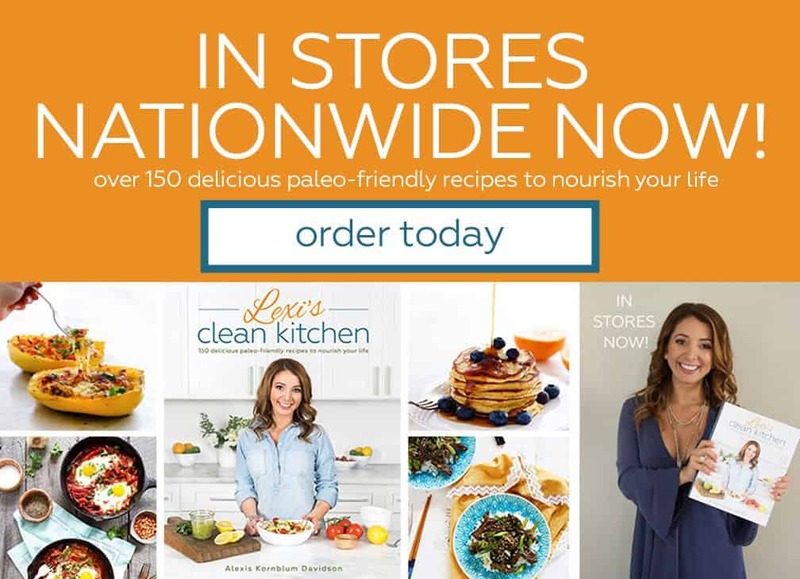 Let this recipe serve more as a guide to using up what you have on hand to create a quick meal that everybody will love, with a really delicious paleo stir fry sauce. We serve this with a garlic scallion cauliflower rice, but you could alternative serve the stir fry with regular white rice if you would like! You could also alternative use another meat here, like thin sliced steak or pork, or you could really fill up on the veggies and make this meatless! But you could really use any veggies you have on hand or what is in season. This is the perfect dish to cook up all year long, but particularly good during the CSA season when your refrigerator is full of veggies! 1. In a bowl, mix together teriyaki sauce ingredients and set aside. 2. In a large skillet, heat sesame oil over medium-high heat. 2. Add garlic and onion and let cook until the onion turns translucent, about 3-5 minutes. 3. Add broccoli, mushrooms, red pepper, and snap peas and cook for 3-5 minutes, or until mushrooms have softened. 4. Add chicken and cook until the chicken is fully cooked through and no pink remains. 5. Pour in teriyaki sauce and mix well. Add in spinach, baby bok choy, and bean sprouts. Once the spinach starts to wilt, turn off the heat and set aside. 6. 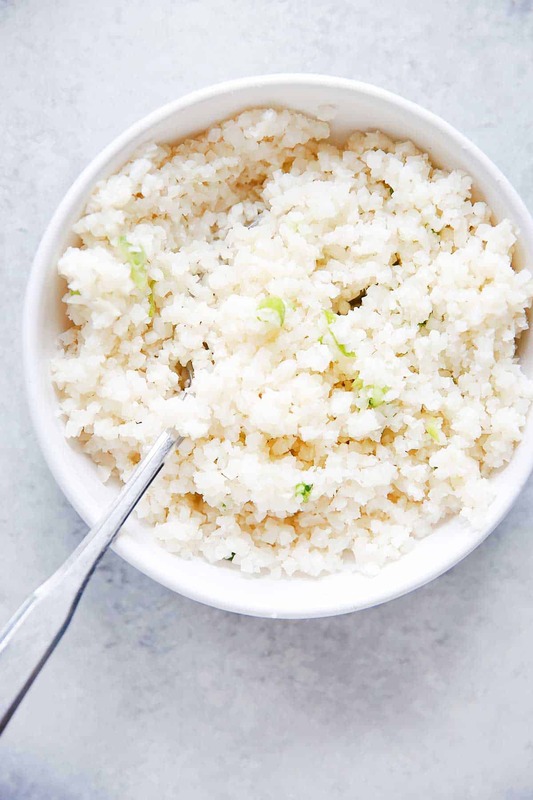 Using a food processor or cheese grater, pulse/grate cauliflower until rice consistency. 3. Heat a medium-sized skillet over medium-high heat. 4. Add in cauliflower rice, seasoned vinegar, salt, and scallions. 5. Let cook, stirring often, for 3-5 minutes or until the cauliflower starts to soften. 6. Transfer to bowl and serve hot. 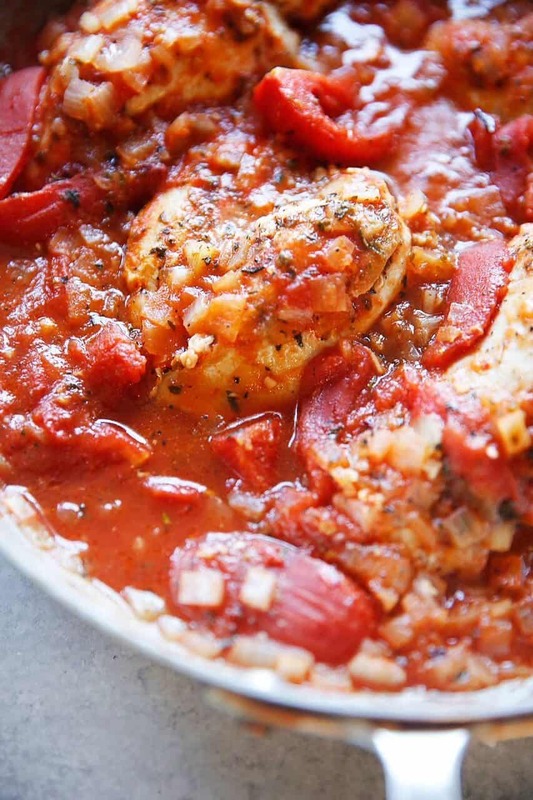 This Quick Spicy Italian Chicken in Tomatoes is such a simple and quick weeknight dinner, that is packed with so much flavor! There is option to turn up, or eliminate the heat of the dish, but either way it’s delicious. 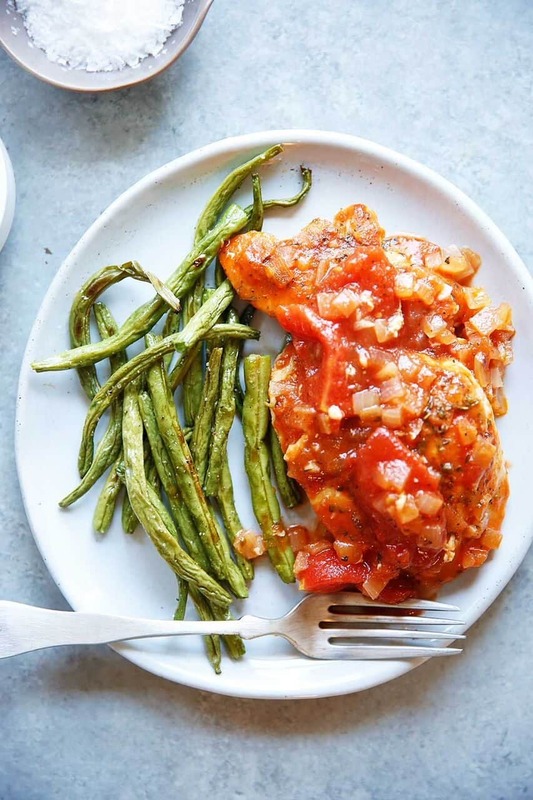 Serve these chicken breasts in tomato sauce alongside roasted green beans and you have yourself a perfect low-carb, paleo-friendly, Whole30 approved meal that takes under 30 minutes to prepare! Talk about a WIN! Easy weeknight dinners are THE BEST! 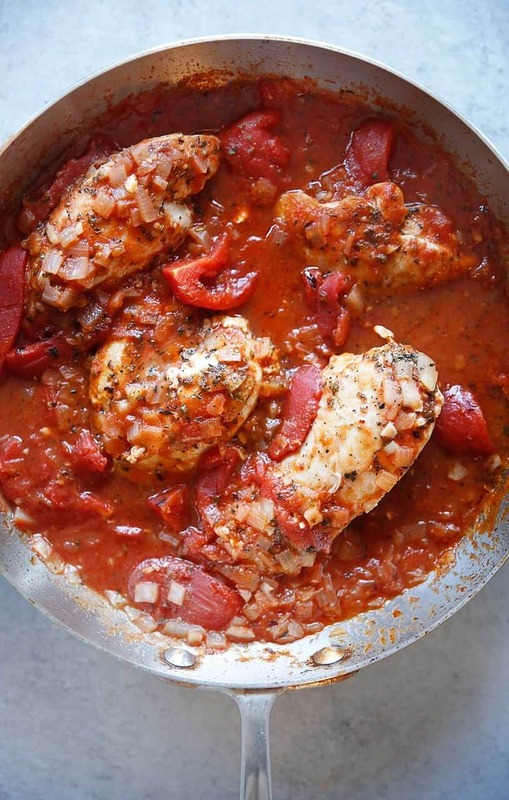 This quick cooking Spicy Italian Chicken in Tomatoes is a super delicious dinner to cook when you have less than 30 minutes to get food on the table and you are relying on pantry staples! We made this low carb by serving it with roasted green beans, but if you want to go a little heavier with the carbs and have a little bit more time on your hands you can serve it with roasted potatoes, rice or pasta. 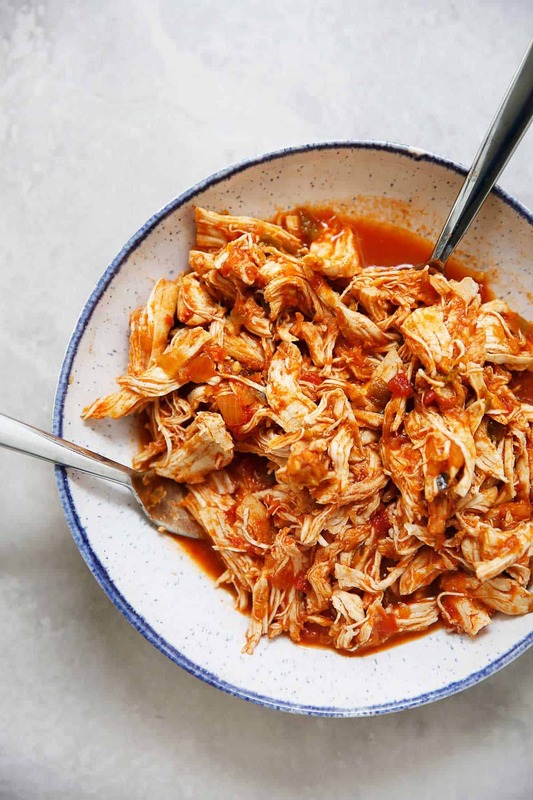 Want to make this easy chicken and tomato recipe without the spice? We love spice, but not everybody does, especially if you are serving kids at the table. Feel free to omit the red pepper flakes in this dish, or lower the heat by adding in just half. You can also substitute whatever seasonal veggies you have on hand to roast as well. Cauliflower would be great here, as would zucchini or eggplant. Heat extra-virgin olive oil in a large sauté pan over medium-high heat. Pat chicken dry. Season with Italian seasoning, sea salt, and pepper on both sides. Gently place chicken in pan. Let sear for about 3-4 minutes on each side, until all sides are nicely browned. Add crushed garlic and onion to the pan and sauté for 2 minutes or until the onions turn translucent. Lower heat to medium-low and add in tomatoes, basil, red pepper flakes if using, and salt and pepper to taste. 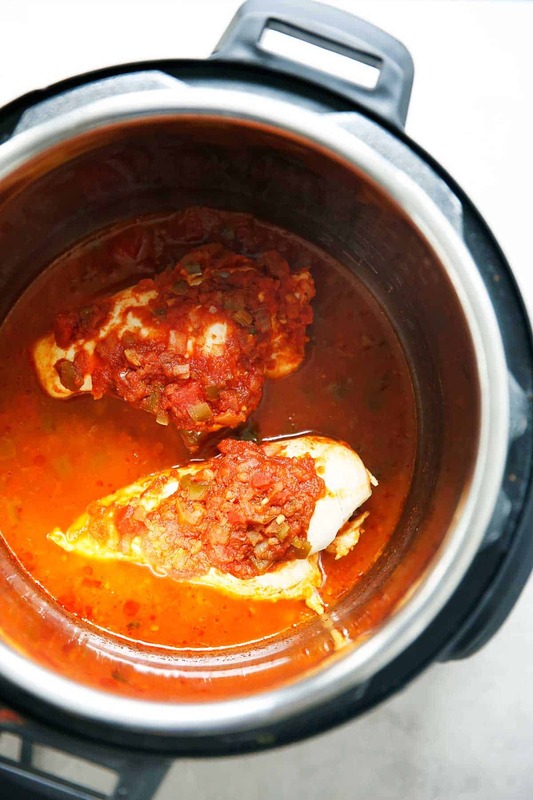 Simmer for 8-10 minutes or until sauce has reduced and the chicken is fully cooked through. While sauce is simmering, pre-heat the oven to 350 ℉. Line a baking sheet with parchment paper. Toss green beans in olive oil, Italian seasoning, garlic powder, sea salt, and pepper. Bake green beans for 10-15 minutes or until fully cooked through. When done, set aside until chicken has finished cooking. If adding spinach, add to the pan for the last 1-2 minutes of simmering until the spinach has started to wilt. Remove from heat. Serve hot with roasted green beans! Green Beans: Pre-heat oven to 350 °F. Line a baking sheet with parchment paper. Toss green beans in garlic powder, salt, pepper, and olive oil. Place on the parchment lined baking sheet. Once oven is pre-heated, bake for 10-15 minutes, or until fully cooked. 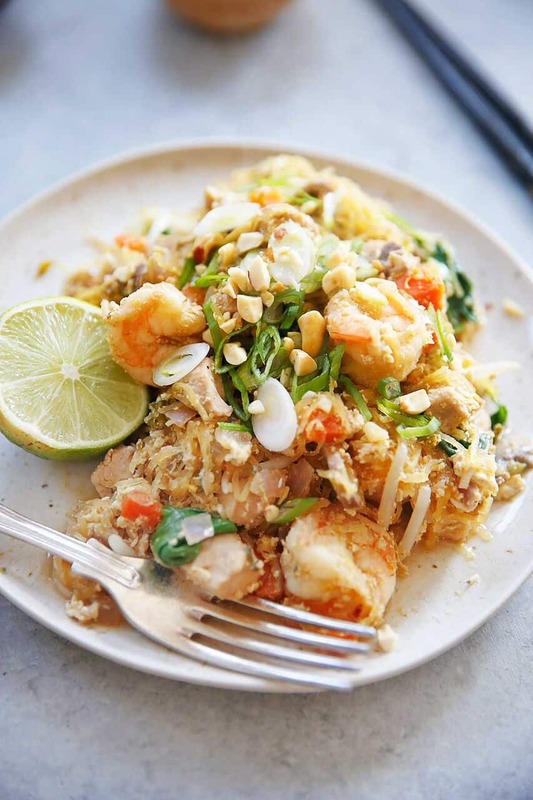 This Spaghetti Squash Pad Thai is low-carb healthier version of the classic take-out dish! It’s so flavorful, full of veggies and a nice mix of textures! It’s a dairy-free, gluten-free, paleo, keto and whole30 friendly option that is going to be a sure hit. 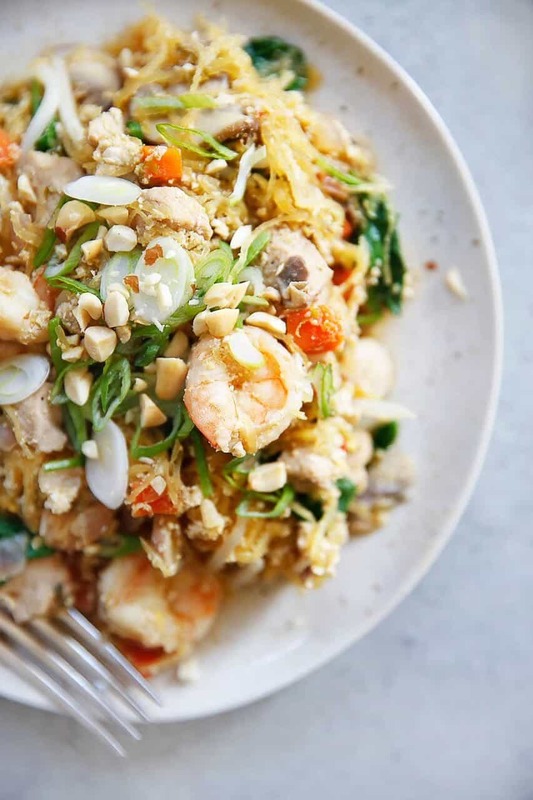 This Spaghetti Squash Pad Thai recipe is one everyone is going to love! It has such an amazing combination of flavors and textures. 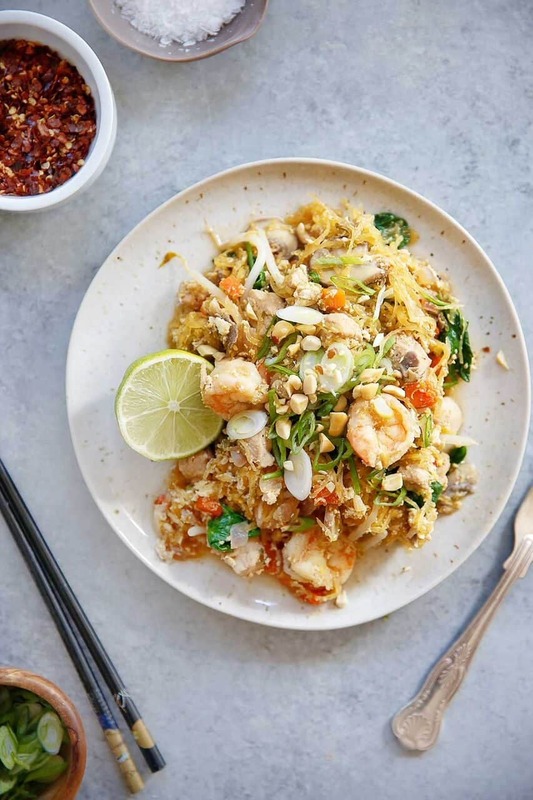 This healthier version of the classic take-out dish is lower carb thanks to the spaghetti squash swap. We included extra veggies here for some added nutrients, but you can feel free to omit or swap with what you have on hand. This recipe is a breeze to make once you have the spaghetti squash, so if you’re planning to make this for a quick weeknight dinner you can roast the spaghetti squash ahead of time (or try it in the instant pot, instructions below) to have this healthy dinner on the table quick. 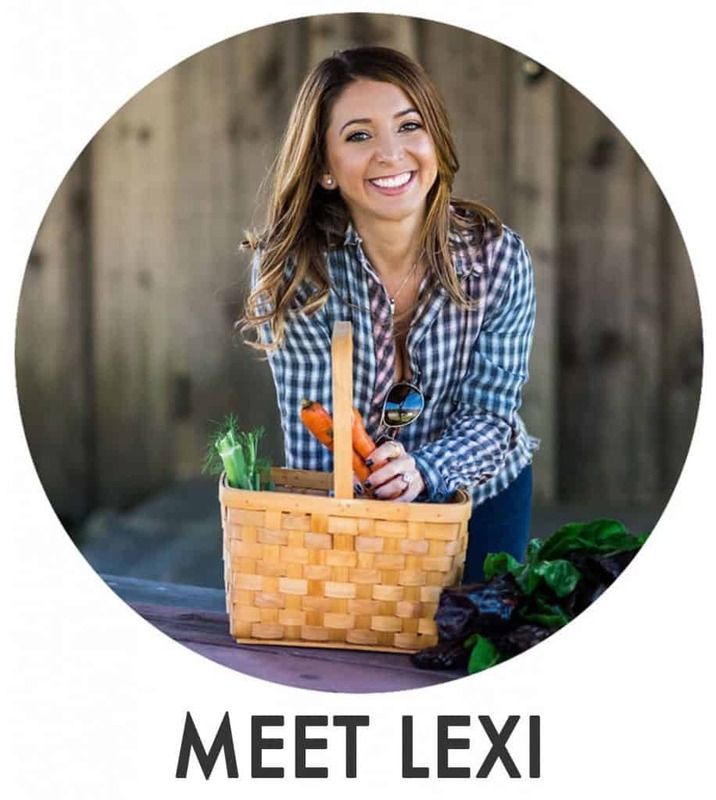 Want to make this vegetarian? We used chicken and shrimp in this recipe, but feel free to add in some extra veggies and omit the meat / seafood to make it vegetarian. If you tolerate soy, you can also add in tofu here. Preheat oven to 375ºF and line a baking sheet with foil or parchment paper. Cut spaghetti squash in half, lengthwise. Place facedown on baking sheet and adding water to the baking sheet. Bake for 45-50 minutes, or until you can pierce with a fork. Simply scrape out “spaghetti” with a fork and Enjoy! Cut 3lb. spaghetti squash lengthwise and scoop out seeds. Add 1 cup of water to the Instant Pot. Stack the spaghetti squash on top of each other (cut-side up). Close the lid and make sure the knob is turned to sealing. When the timer goes off, turn the vent on the top of the lid to venting to release the steam. Once the venting knob has dropped, open the lid and shred the spaghetti squash with two forks to turn squash into spaghetti-like noodles! Roast spaghetti squash: Cut spaghetti squash in half, lengthwise. Scoop out seeds. Brush inside with oil. Place facedown on baking sheet and bake for 45-50 minutes, or until you can pierce with a fork. Simply scrape out “spaghetti” with a fork. Set aside. In a small bowl, mix sauce ingredients and set aside. In a large pan, heat extra-virgin olive oil over medium-high heat. Add garlic, red onion, mushrooms, carrots, bean sprouts, and scallions. Saute until the onion starts to turn translucent and the mushrooms begin to soften. Add in chicken if using raw and cook for 3-5 minutes. Add in shrimp and cook until the shrimp and chicken are fully cooked through, should take about 5 minutes. If using cooked and shredded chicken, add the chicken in with the shrimp. Add three cups of the spaghetti squash to the skillet and pour in the sauce. Mix well to combine. Make a space in the center of your pan and add in 3 eggs. Let cook and mix well, so that the eggs are well incorporated. Taste and adjust spices as needed. Serve warm! Add the optional garnishes of lime, extra scallions, and/or peanuts if desired. 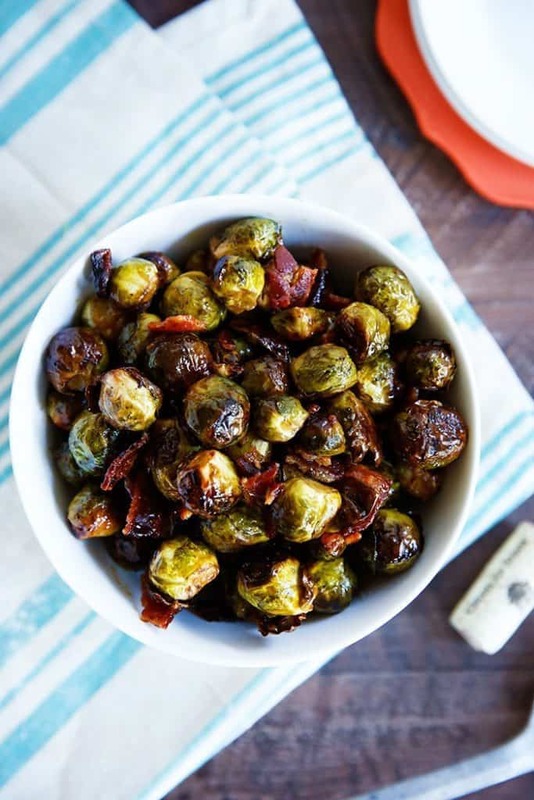 If you are looking for a versatile side dish that works for both a quick weeknight meal or a decadent holiday dinner look no further than this Maple Roasted Brussels Sprouts with Bacon recipe! 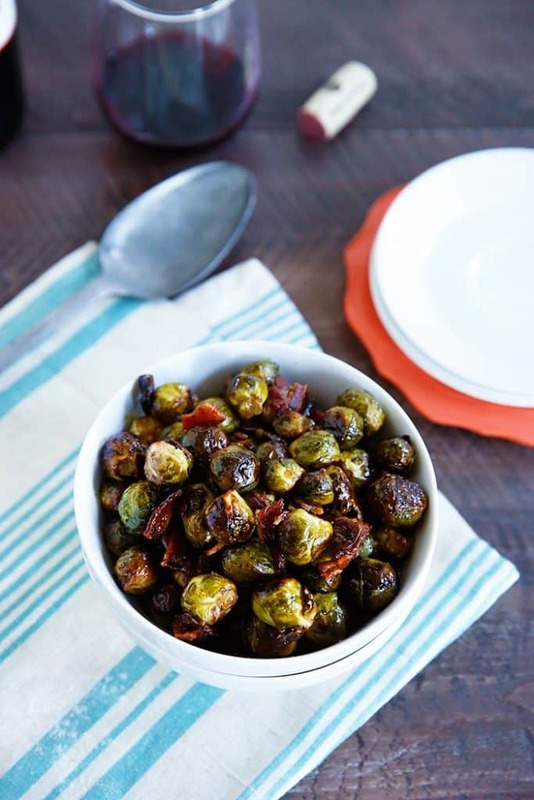 Cooking the brussels sprouts with bacon and maple syrup is sure to make this side dish a fan favorite for everybody! This paleo-friendly recipe is sweet and savory and definitely going to be in your winter meal plan rotation! I was never a fan of brussels sprouts until a few years ago, and now I can’t get enough! This dish converts even those who say they don’t like brussels sprouts! This easy brussels sprouts recipe combines savory and sweet tastes to adhere to just about anyone’s liking! And I mean.. Maple + Bacon = side dish WIN. How good are brussel sprouts for you? Brussels sprouts contain small amounts of vitamin B6, potassium, iron, thiamine, magnesium and phosphorus. 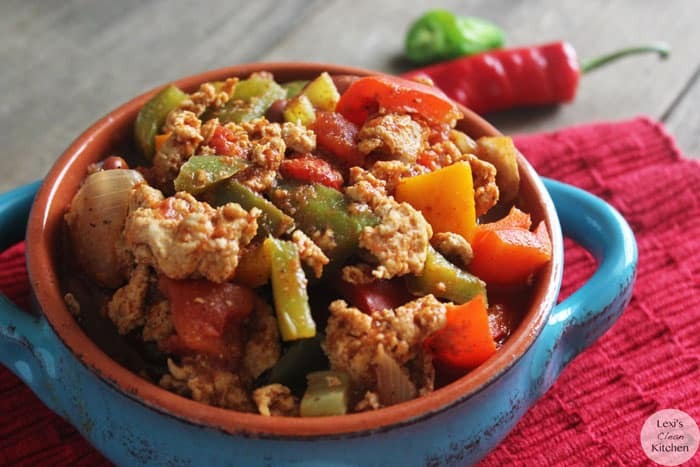 They are low in calories and high in many nutrients, especially fiber, vitamin K and vitamin C.
This is my classic go-to healthy turkey chili recipe all fall and winter long. I call it healthy comfort food in a bowl because it’s hearty and satisfying for all of those chilly days. It is perfect for a big gathering, football Sunday festivities, or for a good weekly meal prep option since there are tons of leftovers! 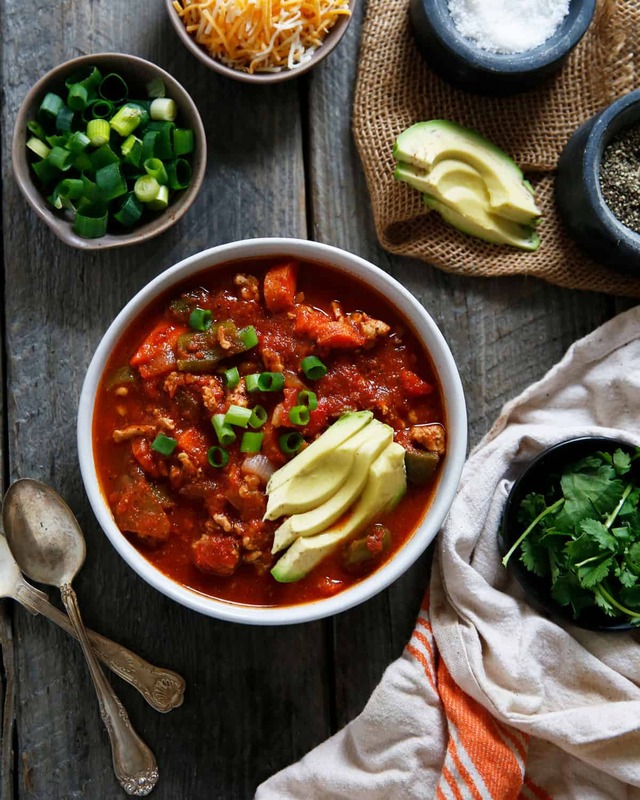 Make it on the stove-top or right in your Instant Pot pressure cooker for an easy turkey chili recipe! Simply swap out turkey for beef to make the best beef chili recipe! The best part? 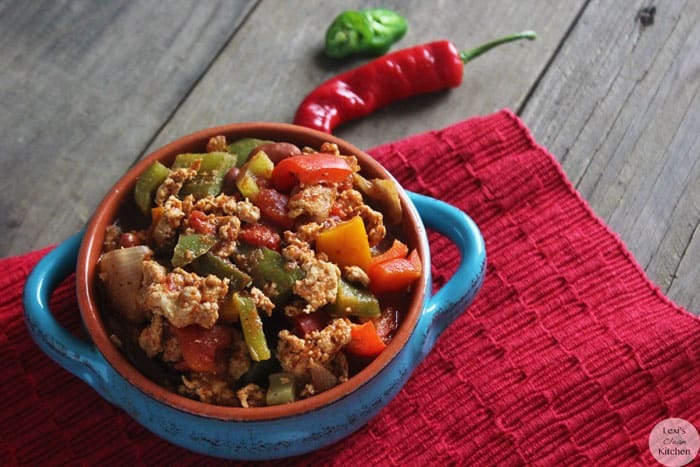 You can customize this chili to your liking. Some days I’ll add more veggies based on what is in season. 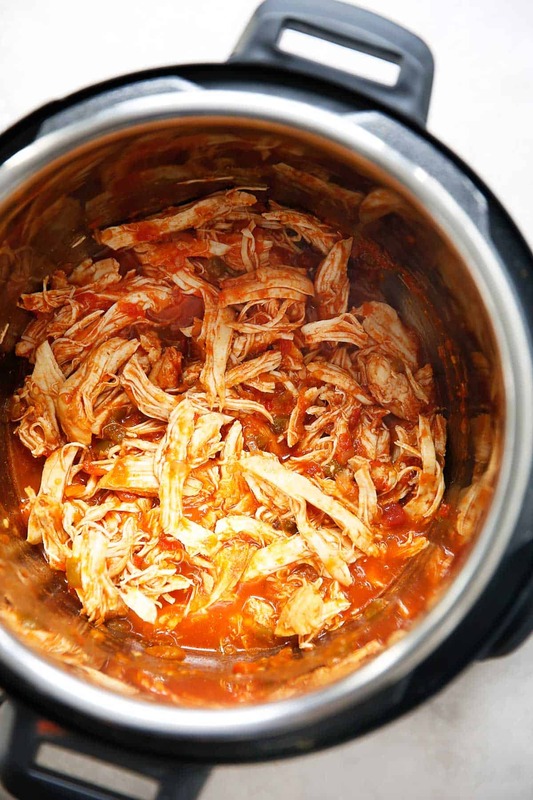 Make it on the stove-top, or in the Instant Pot pressure cooker! I’ve also perfected this chili to be equally delicious with or without the beans. 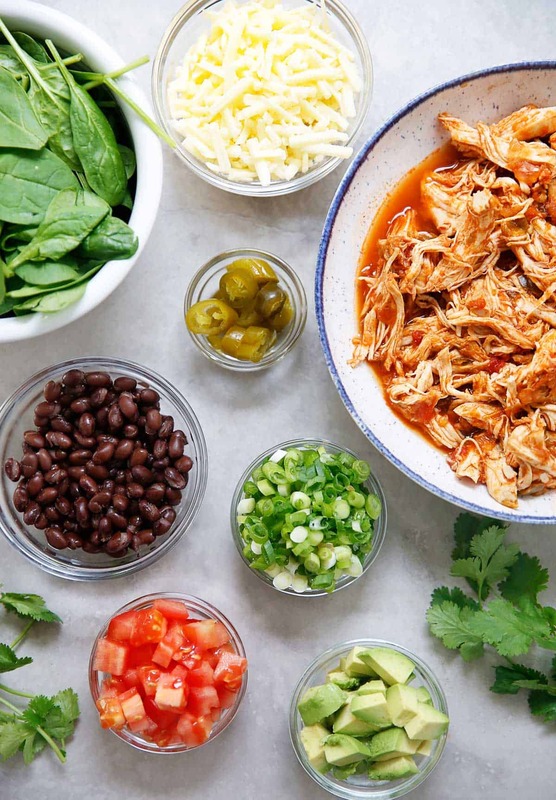 Instant Pot directions included, and Whole30-approved! Ahhh… comfort food. I think I could make this recipe with my eyes closed at this point! It is always a huge hit and it’s one of my top rated recipes. 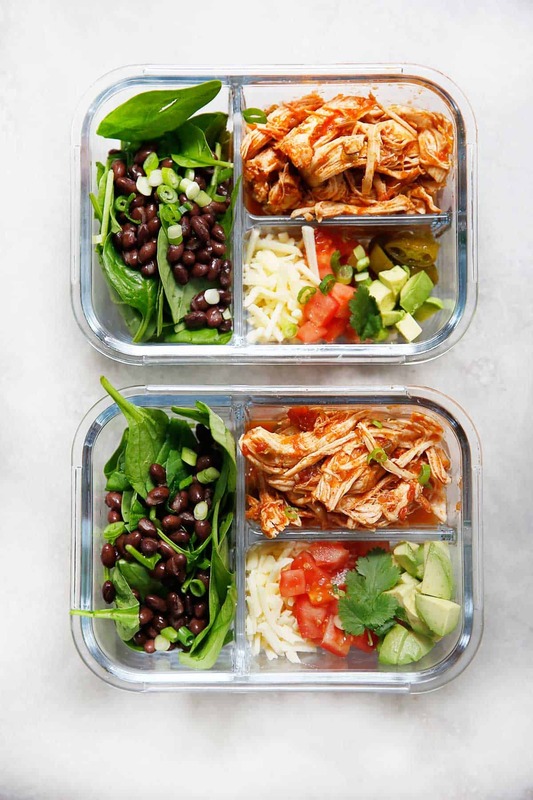 Perfect for a big party, football Sunday, or for a good weekly meal prep (tons of leftovers). The best part of the chili is you can customize to your liking, some days I’ll add more vegetables based on what’s in season! For a beanless turkey chili, and to make this Whole30 compliant, simply omit the beans! They are optional! Using the sauté function, sauté the veggies until soft. Add meat and cook until brown. Lock the lid and cook under manual -> high pressure for 15 minutes. Turn the knob to venting and release the pressure manually or let the pressure naturally come down. Open and taste the chili! Add beans here if adding. Adjust the seasoning if necessary. Notes: If you added too much water, use the sauté function for a few minutes to reduce the water down! What do you top chili with? In a soup pot, heat the oil over medium heat and sauté the garlic, onions, peppers, carrots, celery, and sweet potato, if using, for 5 to 7 minutes, until soft. Add the meat to the pot and cook until browned, stirring often to break up the meat. Once the meat is browned, add the water, diced tomatoes, tomato sauce and paste, salt, and all of the spices. Mix well to combine. If you are adding the beans and jalapeño, do so here. Bring to a boil and then reduce the heat and let simmer, uncovered, until the chili is nice and thick, about 3 hours. Add additional water during this time if you want your chili more souplike. Towards the end of the cooking time, taste and adjust spices as desired. Add additional cayenne for an extra kick, and more salt and pepper as needed. Serve garnished with your favorite chili toppings, if desired. Mine are listed above. Store in refrigerator for 1 week or store in the freezer. If you added too much water, use the sauté function for a few minutes to reduce the water down! Set to manual 20 minutes on high pressure. Quick release, then once the valve has gone down, remove chicken and shred with two forks.